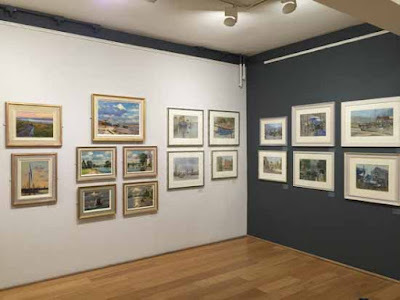 These National Art Societies in the UK focus on subject matter. Interestingly there is no art society dedicated to 'the still life'! The Private View of the Royal Society of Portrait Painters always has a huge number of people. The Royal Society of Portrait Painters (est 1891), or The RP as it is known, is the foremost Society for Portrait Artists and Portrait Painters in the United Kingdom. Most of the portrait painters and artists are available for private and company portraiture commissions. Hence becoming a member of this society opens up opportunities for an additional income stream outside exhibitions. The Annual Exhibition isn't so much a place to sell a painting as a place to generate a commission. Competition to be one of the people who get selected via the open entry is intense and the standard of work selected is often excellent. If you are a serious portrait painter, this is an art society you definitely want on your CV. However the process for making that happen may take some time and involve repeated submission of your work. The Society of Portrait Sculptors, a representative body of professional sculptors committed to making portrait sculpture accessible to a wider public. This is not a national art group but its focus is the tidal reaches of the River Thames and crosses England from Oxfordshire to Essex. The Wapping Group was formally founded in 1946 and initially met to record the busy life of the original London docks. Since then, the range of locations has widened in response to the changes in the economy and the River Thames. The geographical range of the group currently covers the tidal Thames from landlocked Henley in the west to the east coast harbours such as Maldon in Essex. The members now meet on a weekly basis between April and September to paint outdoors, in a wide variety of locations and in all weathers. The group is predominantly male and there are 25 members. They will want to be convinced of your commitment to painting both the Thames and painting plein air before accepting you as a member. Vacancies typically only occur when a member dies or retires. Wildlife and animal art are extremely popular with both artists and art collectors. They also have a number of annual exhibitions which get a lot of visitors. The Society of Wildlife Artists is a registered charity that seeks to generate an appreciation of and delight in the natural world through all forms of fine art based on or representing the world's wildlife. This is an international group of nature artists dedicated to wildlife and habitat conservation, nature art, wildlife art, nature conservancy and the nature and wildlife artist. They produced wildlife paintings, prints and sculpture. The Association welcomes "artwork of ANY animal, be it mammal, bird, reptile, fish or even insect" including domestic animals such as dogs, cats, horses and farm animals. The Society of Botanical Artists was founded in 1985 by the president Suzanne Lucas. It has a very large exhibition of botanical art at Central Hall Westminster in the Spring each year. It has developed and runs a distance learning Diploma Course for aspiring botanical artists. Current members of the SBA act as tutors and assessors. The Chelsea Physic Garden Florilegium Society was formed in 1995, with the primary aim of recording in paintings and drawings, the plants growing in the Physic Garden. The Florilegium Society was established to produce an archive of botanical illustrations of the plants of Sheffield Botanical Gardens. The South West Society of Botanical Artists welcomes anyone with an interest in botanical illustration - students, artists, teachers, collectors, enthusiasts, friends and family. Members of the Society also offer teaching to Diploma level.